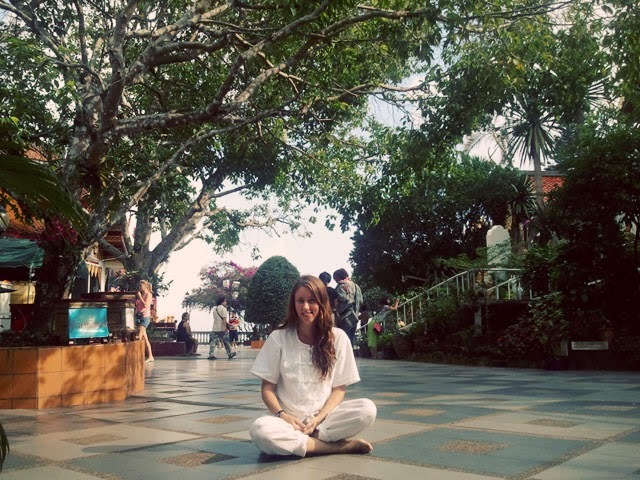 One of the things we wanted to do while in Thailand was attend a meditation retreat. 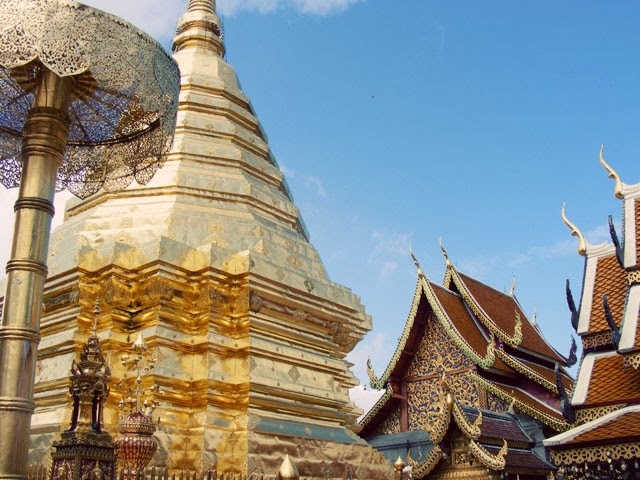 We were planning on visiting the famous Wat on the hill that overlooked Chiang Mai (Doi Suthep Temple) and then found out that it had one of the more popular meditation retreats - so instead of visiting, we stayed for a couple of days (4 nights and 5 days to be exact). Inside the actual temple. Thailand loves its umbrellas. The roof of one of the many side temples around the complex. When we arrived we walked around the temple complex while we waited for the retreat to start in earnest. 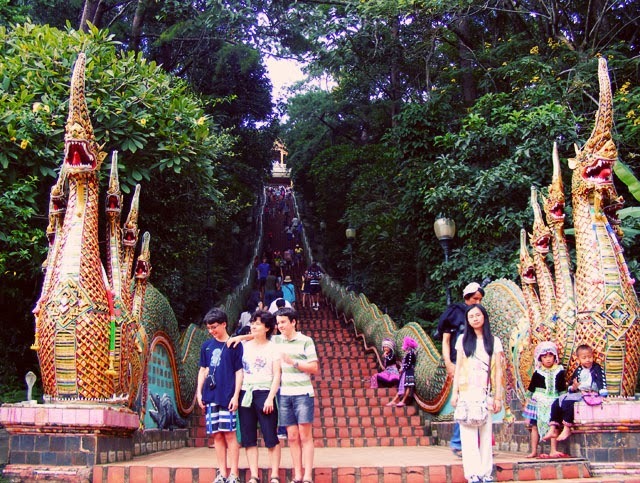 It was very beautiful and had a great view overlooking Chiang Mai. 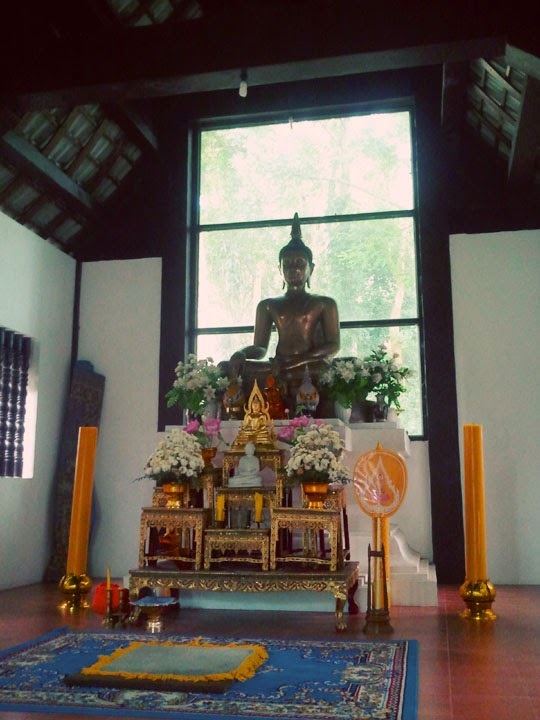 The actual meditation retreat took place in an area below the temple complex that was solely devoted to meditating Farang (tourists in Thai). 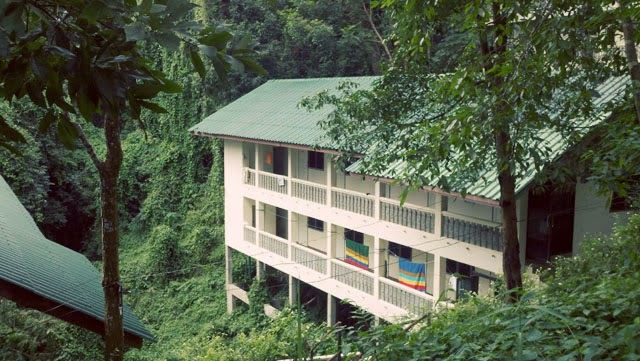 It was a really nice complex with guys' and girls' dorms, a temple just for us, and a multistory building where there was a classroom, dinning hall and meditation room (that neither of us ever used, because it was ugly, and look how beautiful everything else was!). The surroundings were quite beautiful as well with lots of jungle everywhere you looked. One of the dorm rooms we stayed in. 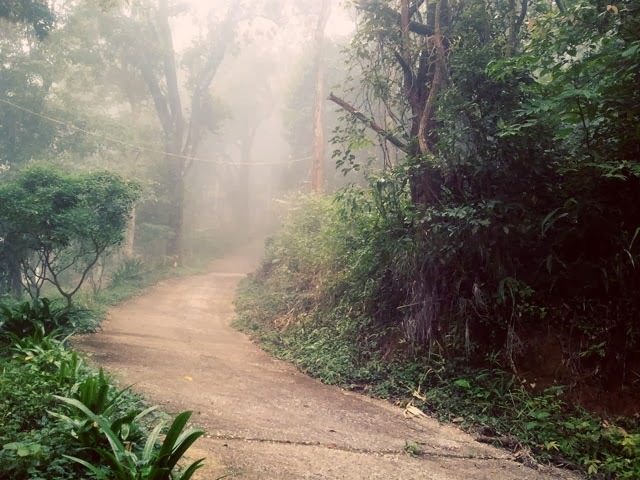 The path that ran next to our dorms leading up to the temple. 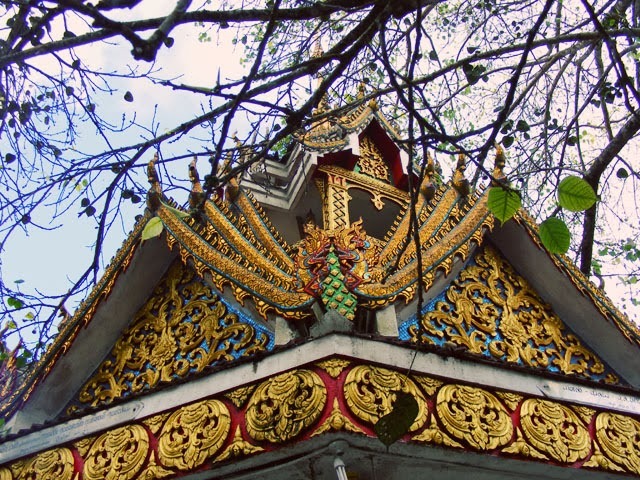 The temple that was just for us meditating Farang. The inside of the temple where we spent most of our time meditating. 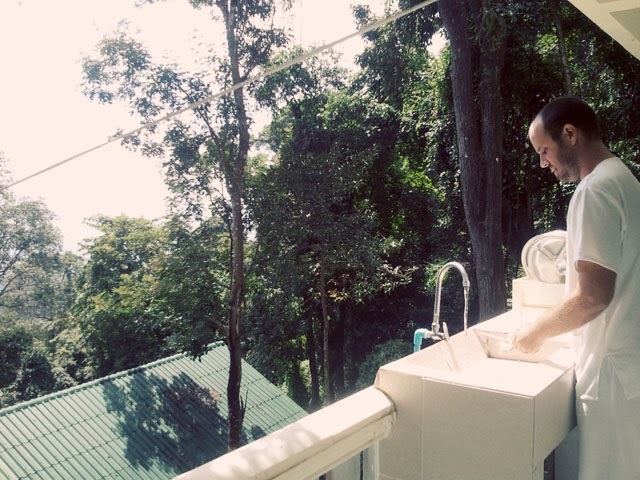 The most scenic place to wash your dishes in the world. Just another crazy night spent chanting Buddhist sutras. We had read that when we arrived at the retreat we would have to take a bunch of vows that we wouldn't kill, lust after things and a bunch of other stuff, but really, when we arrived all the teacher told us not to do was talk, read, write and for the girls, wear makeup. It didn't seem too hard but the not talking for four days was a little more than we could take, so, after the first day, when we really did try to keep our interactions to charades ("I'll meet you here at 11 for lunch." "You have my toothbrush in your backpack." "Oh my God there's soup broth we're allowed to eat, which is sort of like food!") we would sneak off back up to the main temple and whisper-talk. This was doubly hilarious because we were in our meditation clothes, so all the normal tourists would do double-takes when they saw us walking around. We had more than a few talk to us about it--it was like we were a walking advertisement for the retreat. Maggie pretending she's not playing hooky up at the Temple. All and all we kept to the rules most of the time and in the end, enjoyed the experience. We got kind of sick of the food and it soured us on Thai food in general for a little while, and we learned that if you're a big gross spider or any other type of creepy crawly, move to a Buddhist temple because they won't kill you. But besides that it was a good time and we learned a lot about our inner self. We also have endless inside jokes from the morning Dhrama talks given by our Buddhist teacher. It's amazing all the places your mind goes when it's not supposed to. (One of those places was to Cameron Diaz's sweater sets in My Best Friend's Wedding. Another was to playing Boggle before heading off on a seventh grade camping trip in Bear Canyon. And to the Loch Ness Monster.) You realize how much room there really is in your head when you're trying your best to keep it empty. Just like you realize how much time there is in a day when you're not allowed to fill it. Our first day at the retreat, we were shown to our rooms at 2:30. 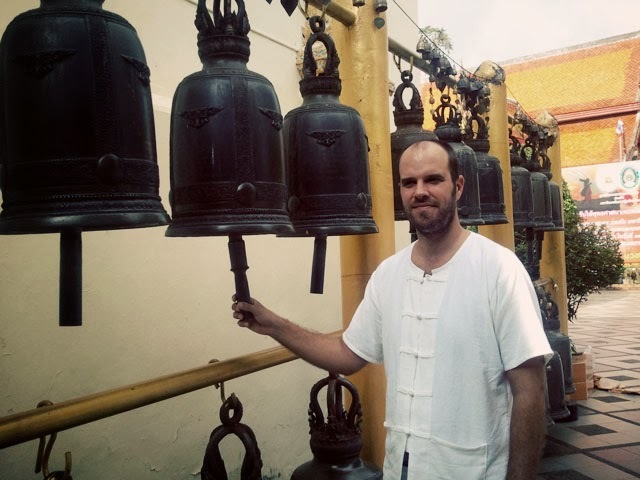 We were supposed to settle in, get in our meditation outfits, and have our first meeting with the Teacher (the monk in charge of the farang) at 4. We'd already been told not to talk, read, write, use computers…we pretty much weren't supposed to do anything for the next four and a half days but meditate. So I left Andrew and headed to my spare little room in the girls' dorm. Everything was so quiet. And so still. And I immediately wanted to get on the internet, or pull out a book, or do some work. I kept reaching for my bag, involuntarily, for a snack, if nothing else. But that was forbidden, too. So I did none of those things. I washed my face, changed into my meditation clothes. Sat on my bed for a while. Walked around the room, and up and down the balcony, admiring the scenery. Tested out the meditation cushions in my room in various configurations. Stretched out my ankles for the lotus position. At that point, I figured it must be almost time for the 4 PM meeting. I checked my watch. It did get easier over our few days there to just be. When I'd done three straight hours of meditating and couldn't stand the thought of doing it any more, but lunch wasn't for another hour, just being was all I had to do. After all, I'd already cleaned my room and made my bed and taken a shower when I was bored earlier in the day. (By lunchtime, which was at 11am, we'd already been up for six hours.) Technically, you weren't really even supposed to actively think about much. Certainly while I was meditating, and even while sitting around in my room, I shouldn't have been thinking about my writing, or about whether the Laos border was open on weekends. 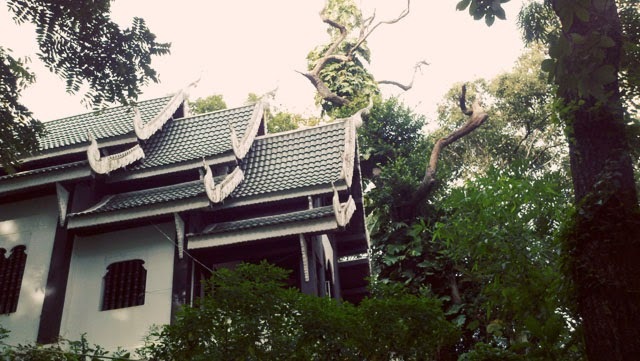 I really shouldn't have been thinking about how, if we ever buy a house, I want it to have a big porch, like the one in the guesthouse in Chiang Mai… (Future, future, future.) And in those times, all I could think about what how much I could be getting done. But that didn't mean I couldn't dream. Delicious meals we'd had just days ago. (Pizza at the American restaurant in Chiang Mai…YUM.) Random foods I hadn't thought of in years. (Einstein's bagels, with honey-cinnamon cream cheese. Subpar Little Caesar's pizza, with green chile we added ourselves. The fish sticks we ate when we were little.) We'd read some accounts of the meditation retreat before we left, and one girl said she had no appetite for anything but rice and vegetables when she left. Well, that wasn't true for us. We stumbled off our taxi from the retreat and straight into the first restaurant we could find, and ordered bacon and french fries and soda. We would have ordered twice as much if we weren't so tired of Thai food at this point. So what does that tell me about food? I don't know, really. That depriving yourself doesn't work, because you'll soon be stuffing burgers in your mouth? The retreat wasn't all coveting things we couldn't have. I did learn to clear my mind far more than I'd ever been able to before, even when it was spinning like crazy, and I hope I'll be able to keep it up. We sat around with dozens of other farang and listened to sunrise lectures on how to live our lives well. We spent sunset chanting, I think mostly about how great Buddha is, but I'm not sure. (Teacher told us that the point of chanting is to more easily clear the mind, because the chanting gives it something to focus on. I can see that.) All in all, I can say we learned a lot at the retreat. But I can't say we were sad to get back to real life. We stayed in a real hotel with a soft bed and an actual bathtub for two days when we got back. That's how much we missed the civilized world. I think we might have gone crazy if we were there for 21 days like some of our fellow meditators were. But if given the choice, yes, I'd definitely do it again.